Greg Tindale honed his writing, performing, and directing skills at the Washington Improv Theater. Greg Tindale honed his writing, performing and directing skills at the Washington Improv Theater in Washington DC as a member of the long running ensembles ‘JINX’ and ‘Jackie’. 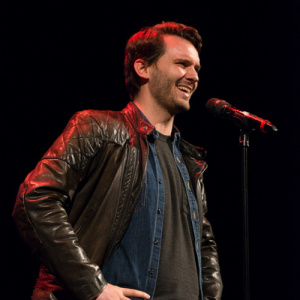 He has performed at the Upright Citizens Brigade Theaters in New York and Los Angeles, The Second City in Chicago, The Sydney Comedy Fest in Sydney, Australia, The Bentzen Ball Comedy Fest and the Kennedy Center, among other venues. Greg served as a staff writer for the DC based TV show, ‘Districtland’ and was an Associate Producer and Assistant Director for the feature film ‘#humbled’. Greg is the Creator, Writer, Director, Producer and Actor in the independent TV pilot, ‘Permanent Mistakes’. He is also the writer of the comic book ‘Roberts and Lion’. He currently tours as 1/2 the ensemble ‘White Privilege Black Power’ with Eva Lewis.